Last year, United offered $1,700 first-class tickets between Boston and Seoul. TPG Editor-in-Chief Zach Honig took advantage of the deal, booking a 10-day trip to Asia. And as luck would have it, when his United flight from Tokyo to Boston was canceled due to snow, the airline booked him in ANA’s new 777-300ER first-class cabin for free. I typically fly United across the Pacific, thanks to my great luck redeeming Global Premier Upgrades (I’ve only missed one segment so far, of the 20 or so I’ve redeemed through Tokyo). But if I’m redeeming miles for a ticket, UA comes in dead last on the list of picks. I’ve been dying to fly ANA, however. 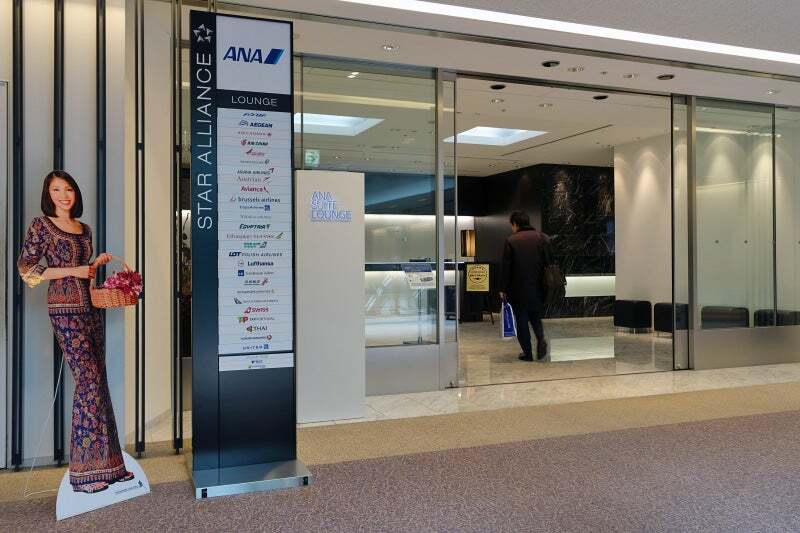 Japan’s Star Alliance carrier is one of the world’s highest-rated airlines — at the very front of its beautiful hard-cover menu folder, ANA proudly states that it’s the only five-star airline in Japan, according to SKYTRAX. 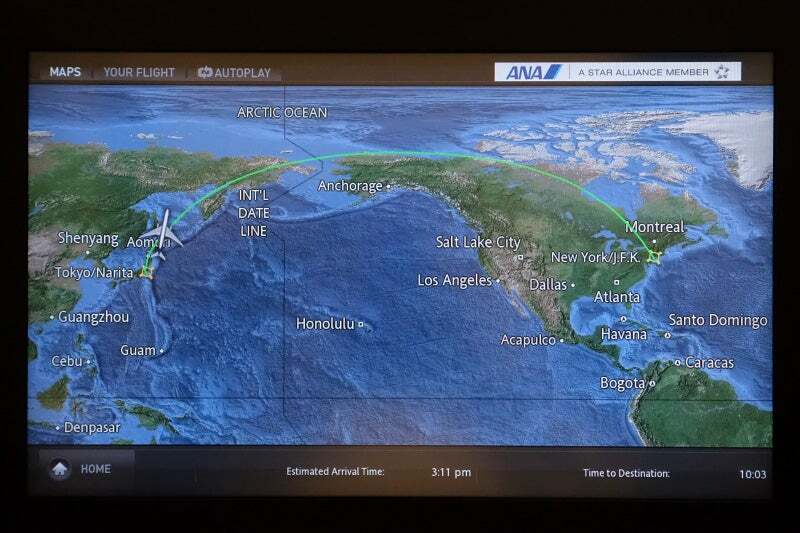 I’ve heard great things about Japan Airlines as well, especially for first-class travel on a 777-300ER (read TPG’s review here), and while I have yet to fly JAL (Japan’s Oneworld carrier), my experience with ANA was absolutely five-star, as you’ll read below. 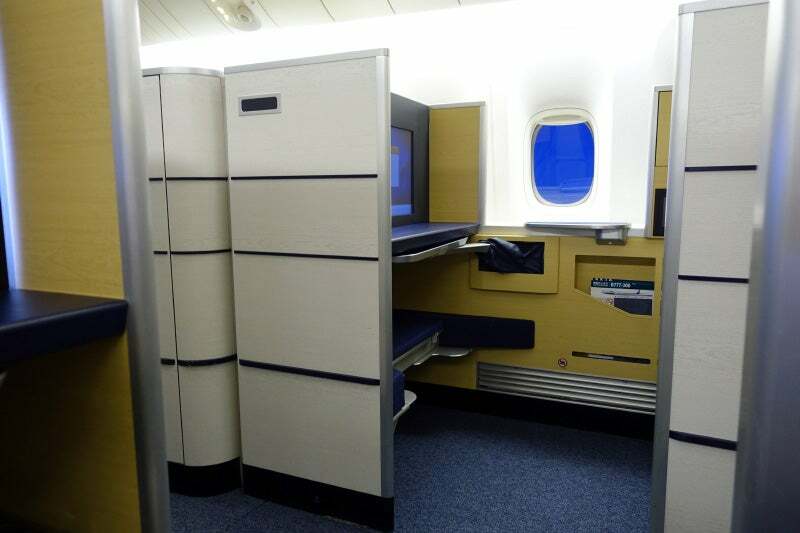 ANA’s 777-300ER first class is arranged in a 1-2-1 configuration, so each of the window seats also has aisle access. Making the experience even more unforgettable was the fact that when my girlfriend, Sarah, and I woke up at the Hyatt Regency Tokyo on the morning of our flight, we were expecting to fly United to Chicago and then on to Newark on a tremendous Global First “sale” fare booked the previous summer. That flight, United 882, was canceled due to snow in Chicago, however, and with no other suitable United alternatives available (United’s direct Narita to Newark flight is served by a two-cabin 777-200, topping out at BusinessFirst), the United phone rep I spoke to graciously rebooked us in full-fare first class (“F” was the only open fare class) on ANA. ANA’s first-class check-in area provides direct access to a private (and empty) security checkpoint. 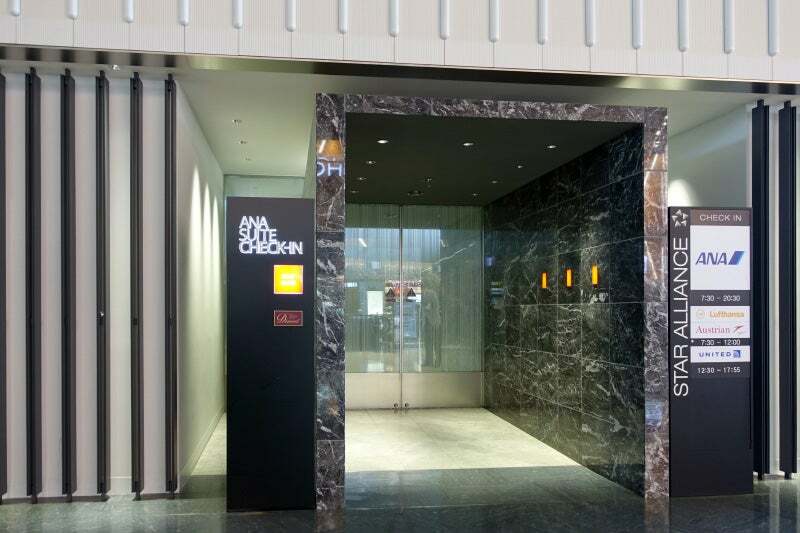 First-class passengers departing Narita on ANA can use a dedicated check-in area in Terminal 1. The private room off to the side has a half dozen ANA check-in desks and one United attendant on hand as well, though there was only one other passenger completing the process when we arrived. After a minute or two, we had our boarding passes and were on our way through the dedicated first-class screening checkpoint, where we were the only passengers. Sarah had to remove her boots, but the security attendant provided slippers for her to wear while walking 10 feet across the spotless carpet. After a very short immigration line we made our way to one of Narita’s two ANA Suite lounges. The ANA Suite Lounge is very similar to its business-class equivalent, but it’s much less crowded during peak times. The ANA Suite lounge is accessible only by Star Alliance first-class passengers and ANA’s top-tier elites (traveling in other classes). There was only one other guest in the lounge when we arrived, and three attendants waiting to assist. One showed us to our seats and offered cold towels and Champagne. 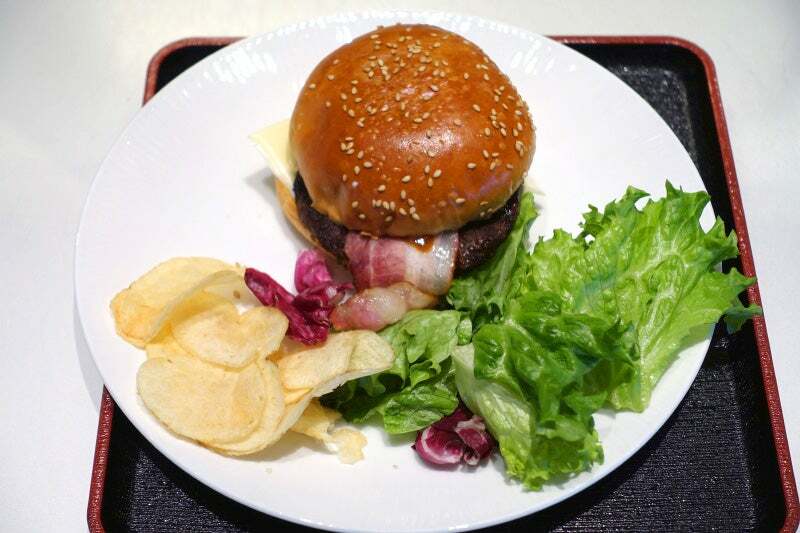 The ANA Suite Lounge offers made-to-order items, such as this cheeseburger, but you’ll probably enjoy the food more on board. Over the next hour, the lounge quickly filled up, with roughly two dozen guests in the main seating area by the time we were ready to board the flight. 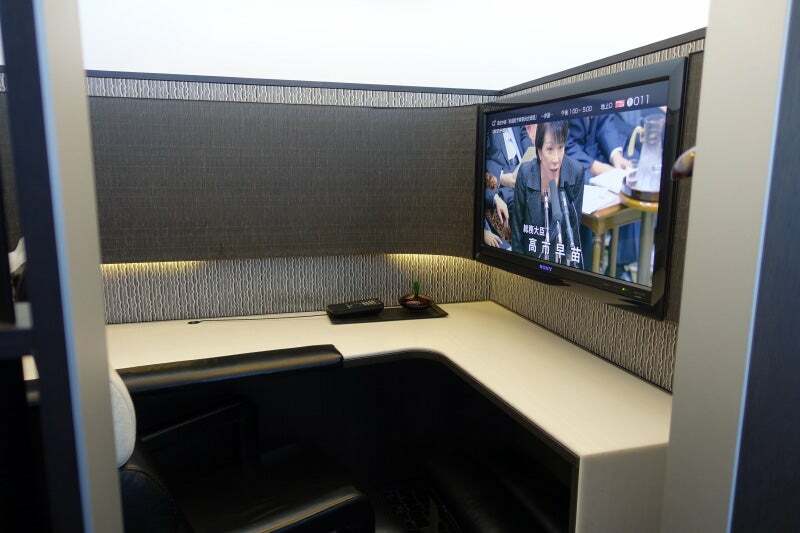 The ANA Suite Lounge has several cubicle workstations, each with its own HDTV. ANA’s first and business-class lounges both have shower facilities and a variety of seating, so even if the front of the lounge fills up there’s still usually plenty of room to stretch out in the back. The Suite lounges also include a room with several work stations on one side and a set of cubicles on the other, complete with comfy chairs, noise-canceling headphones and individual TVs. 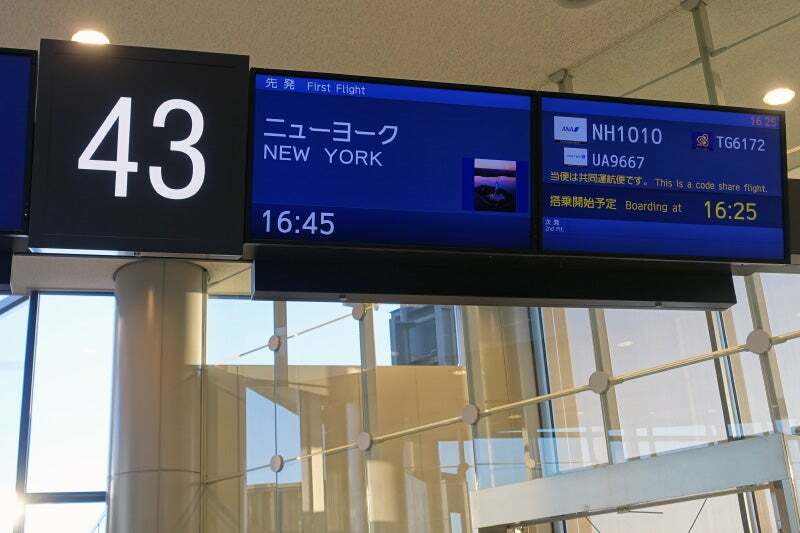 After a short delay, our flight boarded through Narita’s gate 43. Our departure gate, 43, was just outside the lounge. We arrived about 10 minutes after boarding was set to begin. One of the gate agents (there were at least four) announced that boarding would be delayed “for aircraft fueling,” and after another 15 minutes or so we were on the plane. As we entered through the dedicated first-class jet bridge, one flight attendant showed Sarah to seat 2D while another took me to 2G, a pair of seats in the center section of the second row. ANA’s 777-300ER first-class cabin includes eight seats in a 1-2-1 configuration. The three other passengers boarded just a minute later — all of the seats on Sarah’s side of the plane were filled, while the other three on my side were empty (score!). 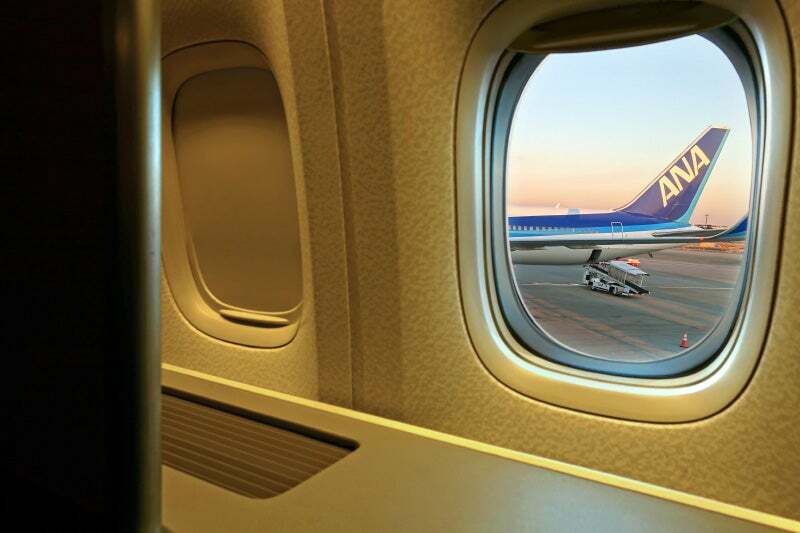 A first-class window seat on ANA’s 777-300ER. Unlike with some other airlines, even the center seats in ANA’s first class are incredibly private. That means they’re not ideal for couples traveling together, as the only way to communicate is through a small opening between the seats (a sliding door separates the two if you happen to be seated next to a stranger). The window seats offer even more privacy, though because of the seat design, you need to lean forward quite a bit to look at the window. A Rimowa amenity kit was waiting at each seat. Waiting at our seats were a set of pajamas, a separate cardigan, a Rimowa amenity kit, Sony noise-canceling headphones, slippers, a light blanket and a large, comfortable pillow. 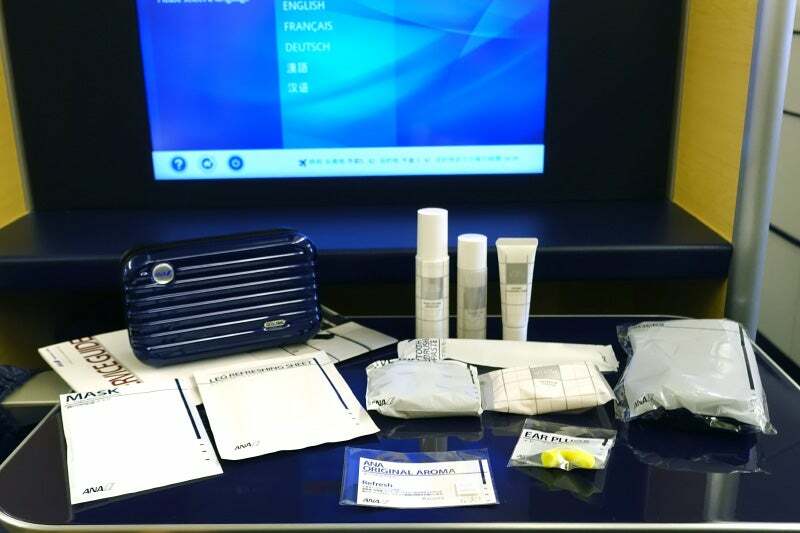 A flight attendant came by to explain the seat and amenities, and soon returned with even more goodies, including an additional toothbrush set, eye masks, earplugs and refreshing face masks. I obliged (you can never have too many disposable toothbrushes) and got to work taking pictures of the seat. When the flight attendant saw me photographing the seat, she offered to take a picture of me and Sarah. The flight attendant then asked me if I’d like to change into the pajamas. I said that I would, and she ran off to confirm that the “larger” bathroom was clear. She returned to say that it was, so I went to change. While larger than the other, the main first-class bathroom is still considerably smaller than what you’d find on many other airlines, including Cathay Pacific, Thai and even United (on select 777s). It was just barely large enough for me to change. There are more amenities in the bathroom, including additional toothbrushes and face wipes. There’s also a Japanese bidet-style toilet, a platform that lowers down so you don’t have to stand on the bare floor when changing and an automated sink. Each first-class seat had a small pillow and blanket; proper bedding is stored until you request turndown service. After changing, I went back to my seat. 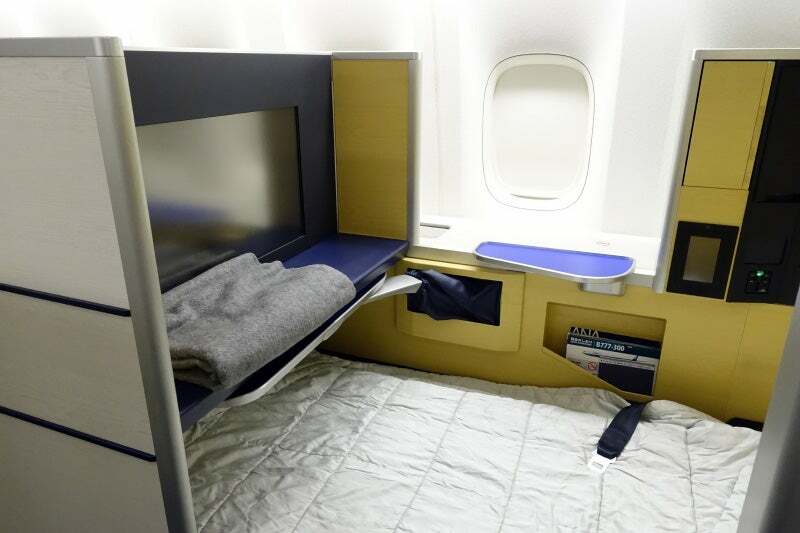 ANA’s 777-300ER first-class seats are perfectly rectangular, and all eight are identical. 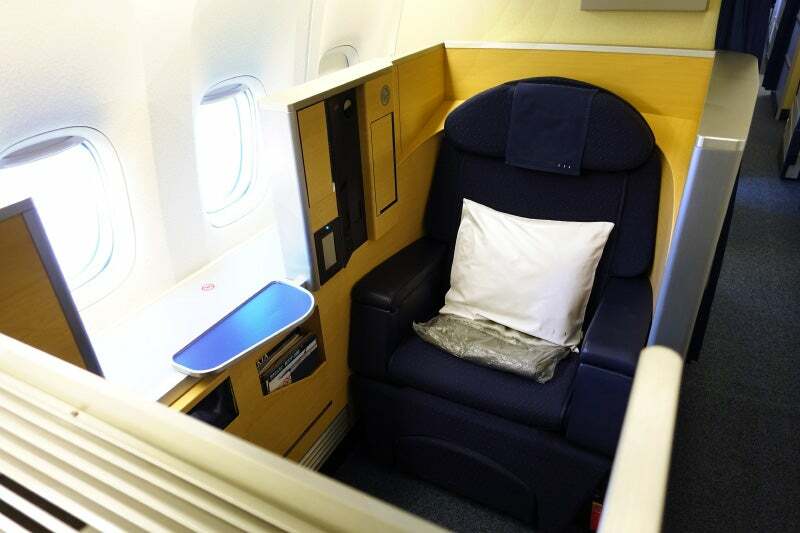 The seat itself is large, although not obscenely so, as you’ll find on Cathay Pacific and Singapore. At the front of the seat there’s a huge 23-inch HD display with a wide storage counter below and a large ottoman with room to accommodate a small roller bag below that. 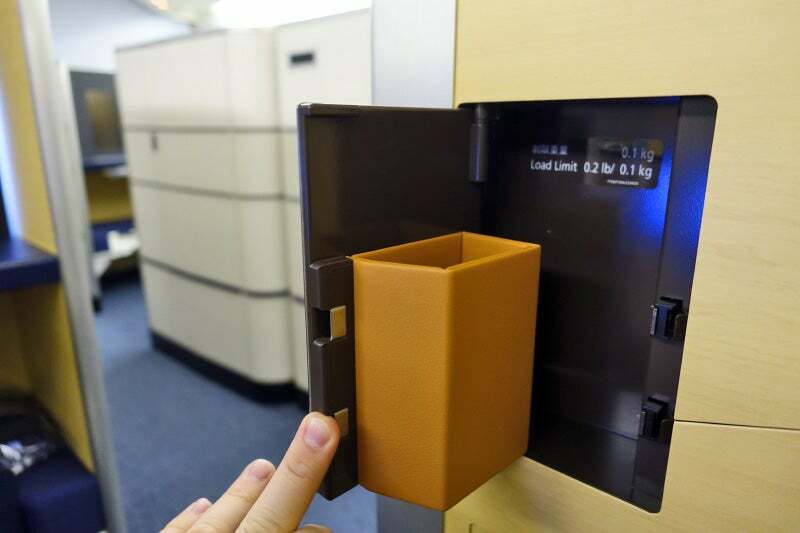 The gigantic tray table slides out from under the TV, while a smaller beverage table is available just in front of the left or right armrest (depending on the seat). Each first-class seat has plenty of storage, including a glasses compartment. Next to the drink table you’ll find three additional compartments, including a pair with mirrors — two of the compartments are large enough to hold a camera or phone, while the third has just enough room for the wired TV remote. Below that are USB, iPod and power ports, two light switches for ambient lights around the seat, and an intuitive though not terribly responsive seat control. There’s a dedicated eyeglass compartment on the other side of the seat. We pushed back from the gate about 20 minutes behind schedule, but the captain came on the PA to announce that we should arrive more or less on time. I began playing with the entertainment system (there were quite a few new releases available) and settled on the movie Nightcrawler, which Sarah and I timed to start together. Each ANA first-class seat has a large, 23-inch HDTV. After takeoff and a rather bumpy climb out, the flight attendant working my side of the cabin came out with food and beverage menus, presented in a hardcover folder. 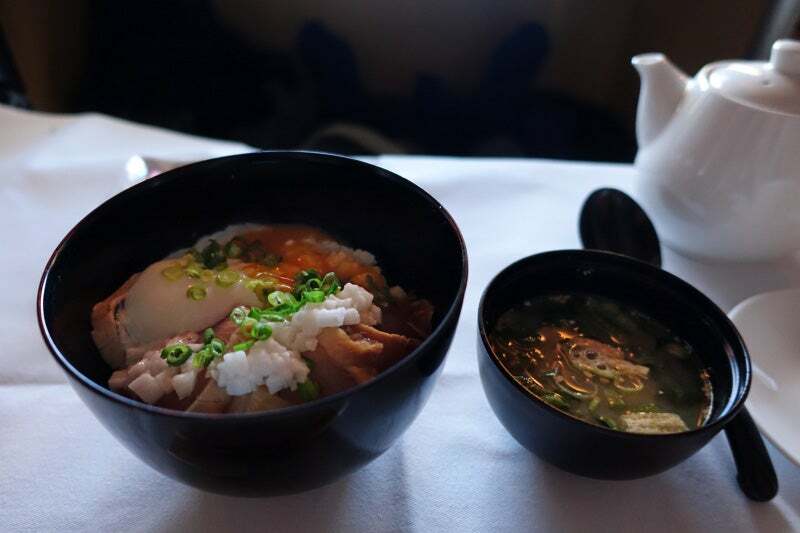 As is typical for flights to and from Japan, ANA offers both Japanese and Western set menus; having had my fill of Japanese food in Tokyo, I opted for the Western menu. I started the meal with a trio of appetizers and a glass of Krug Champagne. A few minutes later, the flight attendant returned to take my drink order (Krug). She returned with the Champagne and a beautifully presented trio of amuse bouche items, including sea bass, foie gras covered in jelly and a mini oyster and vegetable kabob, along with three small cheese breadsticks, at which point she took my meal order, as well. Unfortunately, I tasted the foie gras before realizing what it was; the practice of manufacturing foie gras disgusts me, so I don’t like to eat it. Unless you don’t mind spending hundreds of dollars to get some work done, I’d avoid the pricey in-flight WiFi. At this point, I decided to try out the in-flight WiFi on my iPhone. 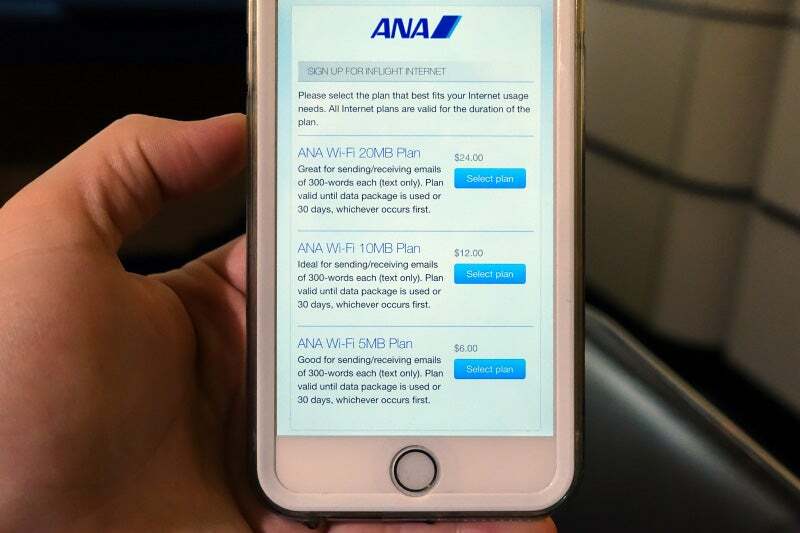 ANA’s WiFi is powered by OnAir, which unfortunately means that it’s billed based on usage. I opted for a 20MB plan for $24 (ouch! ), though 5MB ($6) and 10MB ($12) options are available as well. I’m not sure what I did wrong, but after syncing four emails, three of which were from OnAir (without loading images), the “portal” stated that I had used all 20MB of my paid data. I lost interest after that, and went the rest of the flight without WiFi. 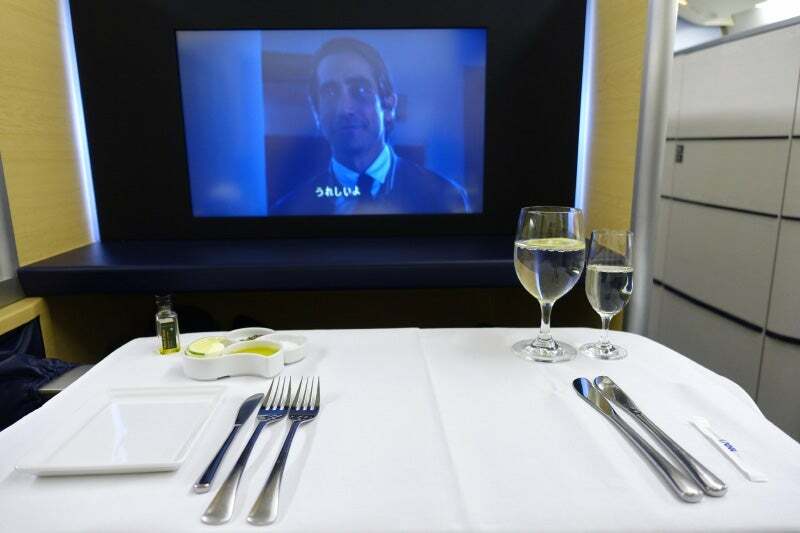 ANA’s first-class meal service is a very formal affair. Unlike on United, where a flight attendant responding to a call button summons without giving you a death stare is considered good service, even small details seem to matter very much to ANA, which — for better or worse — made ordering a meal a rather complicated process. 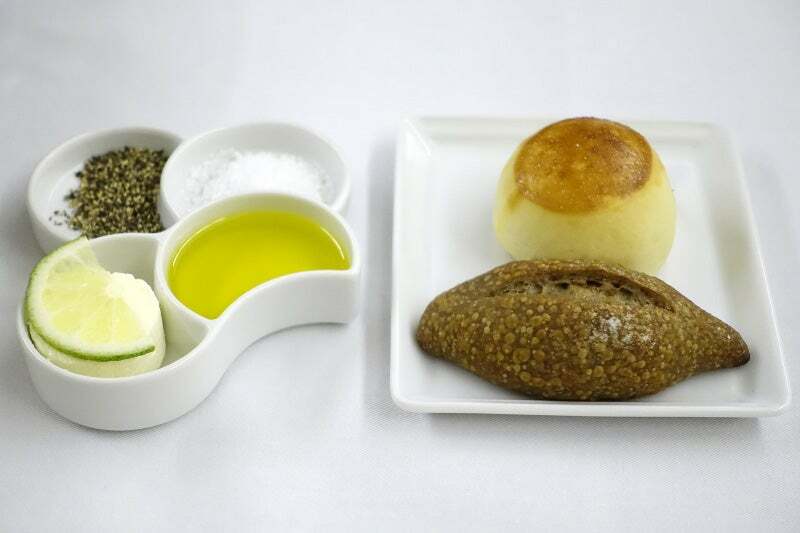 Bread with salt and pepper, olive oil and butter in ANA first class. With my order squared away, the flight attendant left but quickly returned to clear my amuse bouche plates and Champagne glass, then set the table for the main meal. The crisp white linen table cloth covered the entire table, upon which she placed a pair of forks and knives, a dish with sea salt and pepper, another with butter and olive oil, a bread plate, a toothpick, a glass of water and a smaller glass of sake. 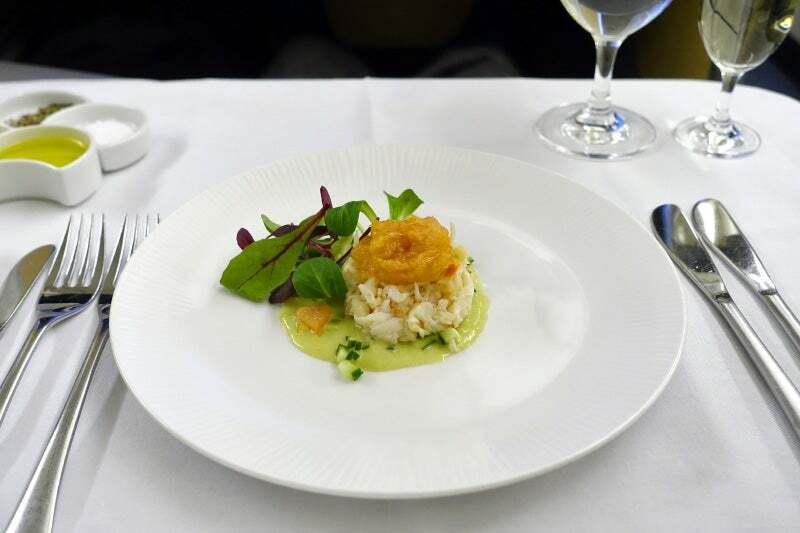 The delicious ANA first-class crab appetizer. She returned a moment later with my bread selection and the crab appetizer, which was served with grapefruit and cucumber (I ate every bite!). The salad was excellent as well. Then the salad arrived, which was served with the Japanese dressing on the side. The greens were fresh and crisp, and the sliced cheese helped balance out the slightly salty soy sauce dressing. 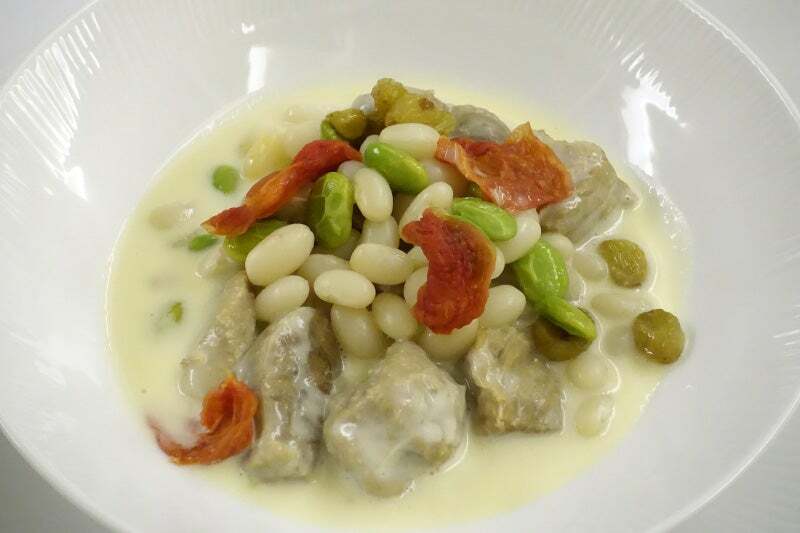 My veal entree, with white beans and edamame. Next, the entree arrived. The veal was very tender and delicate, while the white beans and edamame were slightly undercooked (likely by design). The cream sauce was surprisingly light and didn’t overpower the flavor of the veal. 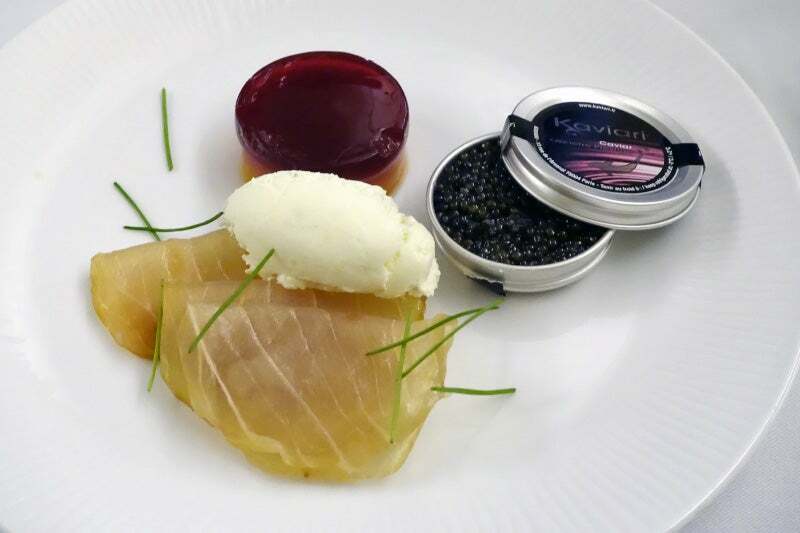 Don’t forget to ask for caviar! At this point, I realized that I hadn’t received the caviar course. Apparently you need to order that as well, which I did right after finishing the main course. 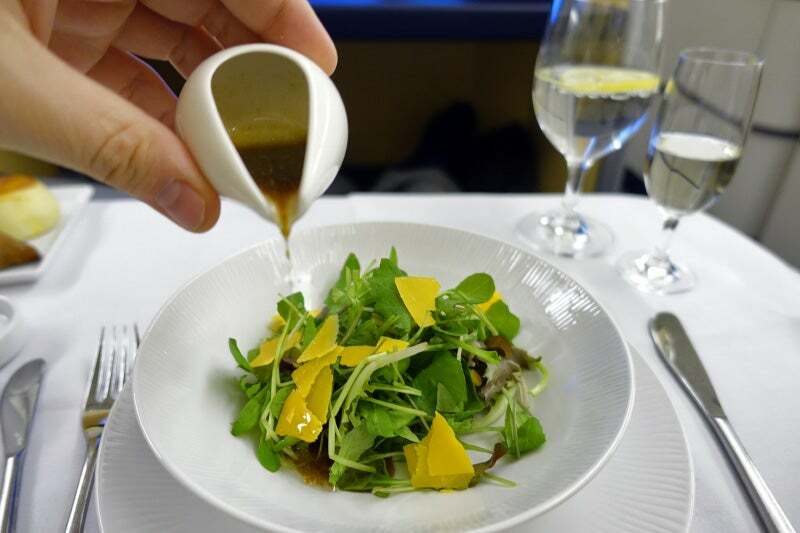 It was delicious as always — on this ANA flight, it was plated with swordfish and a beet puree/jelly, but lacked the traditional accompaniments. For dessert: a caramelized apple tart. Finally, I had a caramelized apple tart for dessert, which, like the rest of the meal, was superb. The flight attendant converted the empty seat next to mine into a bed. Following dinner, the flight attendant made the adjacent seat (2K) into a bed for me, complete with a comfy mattress cover, a light duvet and two pillows, including one with a memory foam filling. I watched most of my second movie (The Judge), then headed across the aisle for a nap. Tea time in ANA first class. 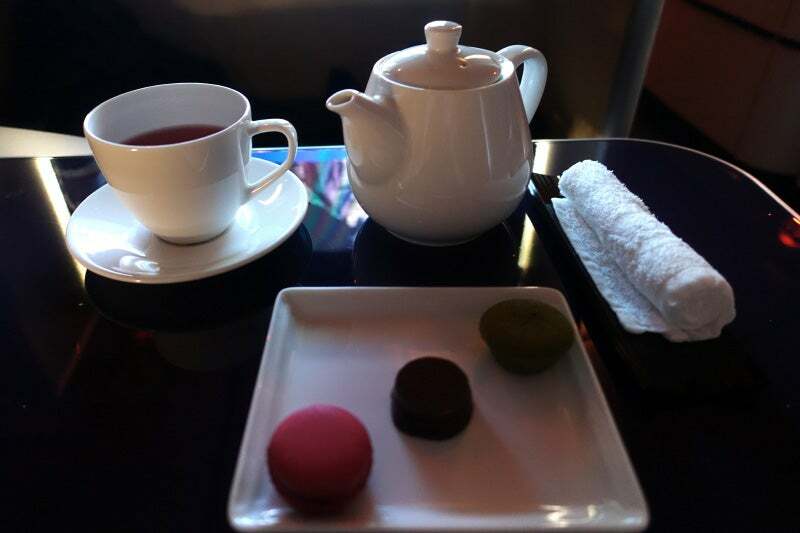 I woke up about five hours from New York after sleeping for nearly four hours, at which point I returned to my seat and ordered a pot of tea, which was served with petit fours. One of the many snack options in ANA first class. When the flight attendant brought my tea, I ordered a snack of sliced albacore tuna served over rice. (ANA offers a large snack selection, including udon noodles, ramen, salmon, clam chowder, a beef and mushroom curry and cheeseburgers.) The flight attendant returned a few minutes later to set my table yet again, then she brought out the tuna dish and a small side of miso soup. 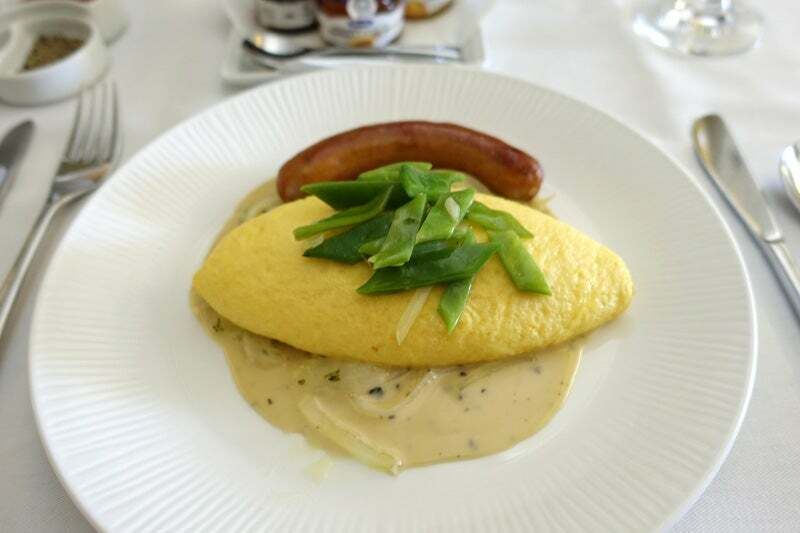 ANA’s omelette didn’t make me miss United’s catering one bit. After another couple hours of playing Tetris on the entertainment system (the game section is unfortunately quite limited) and writing this trip report, we were 90 minutes from JFK and it was time for breakfast. I opted for the “International Course,” which includes eggs, sausage and yogurt. 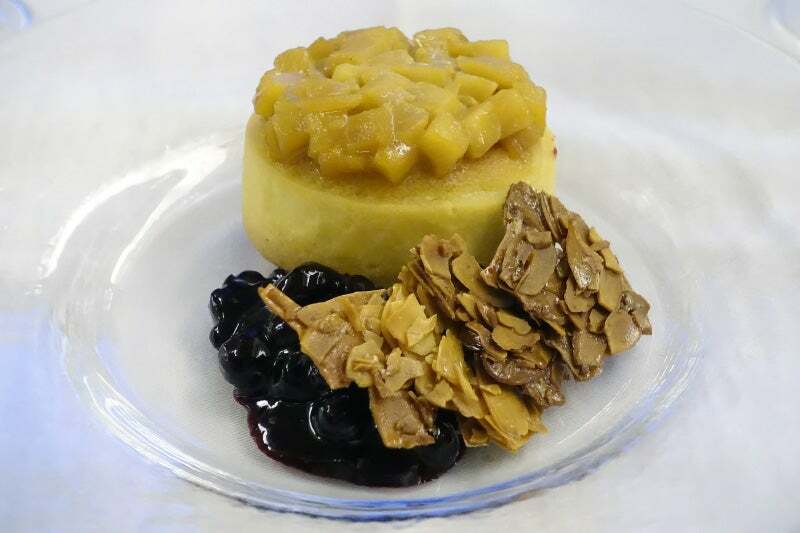 On paper, it sounded just like United’s (in)famous breakfast spread, but being that this is ANA, the presentation and quality of the food far surpassed its joint-venture partner’s. 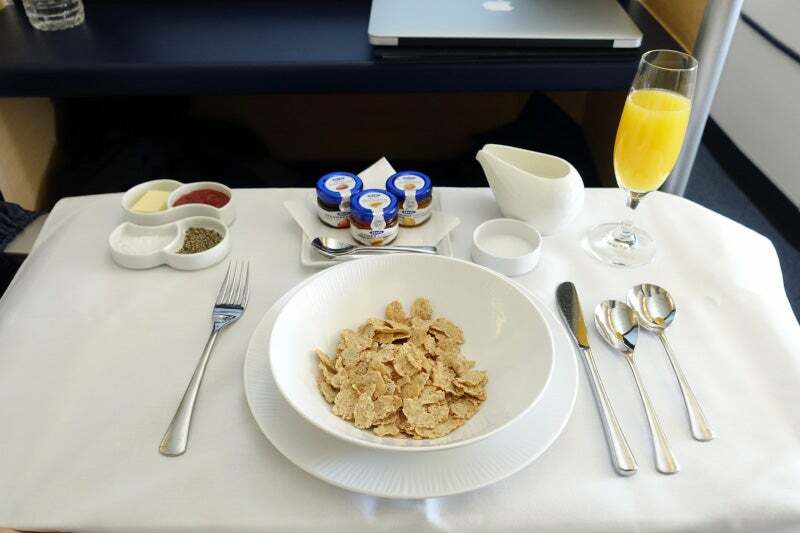 Corn flakes and jam in ANA first class. And if that wasn’t enough, I also received corn flakes (with sugar on the side), along with strawberry jam, orange marmalade and honey … each with their own spoon! 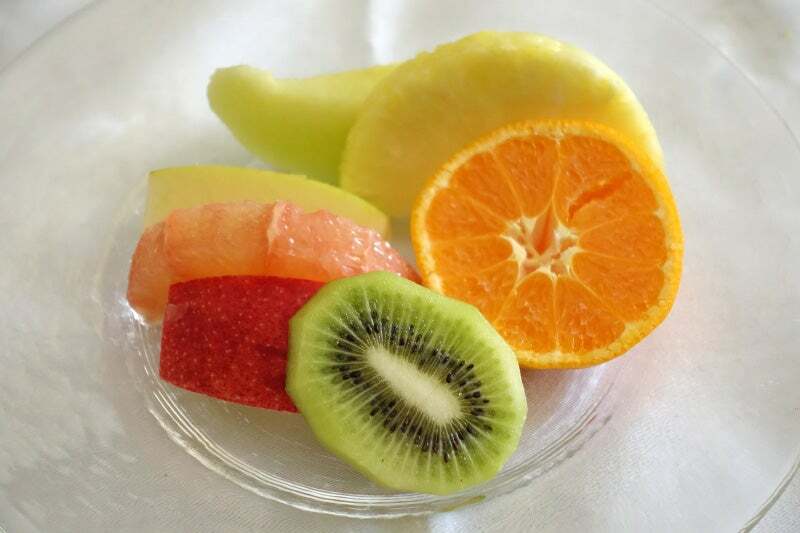 Delicious fresh fruit in ANA first class. And finally, the flight attendant brought out a beautiful bowl of fresh fruit to complete the meal. It’s clear that the flight attendants really wanted us to enjoy the flight. They weren’t the most talkative (the service was very formal), but I could tell that our satisfaction was of the utmost importance, which is absolutely not something I could ever say about a US carrier. I love ANA’s attention to detail — from an absolutely spotless bathroom (I almost don’t want to call it a lavatory), to the flight attendants folding the blanket and repositioning my pillow perfectly each time I left my seat, it’s clear that this crew went above and beyond. The flight attendants also walked through the aisle every few minutes throughout the entire flight, and appeared within five seconds of pressing the call button. My first-class bed on ANA’s 777-300ER. I still can’t believe my luck with this flight. 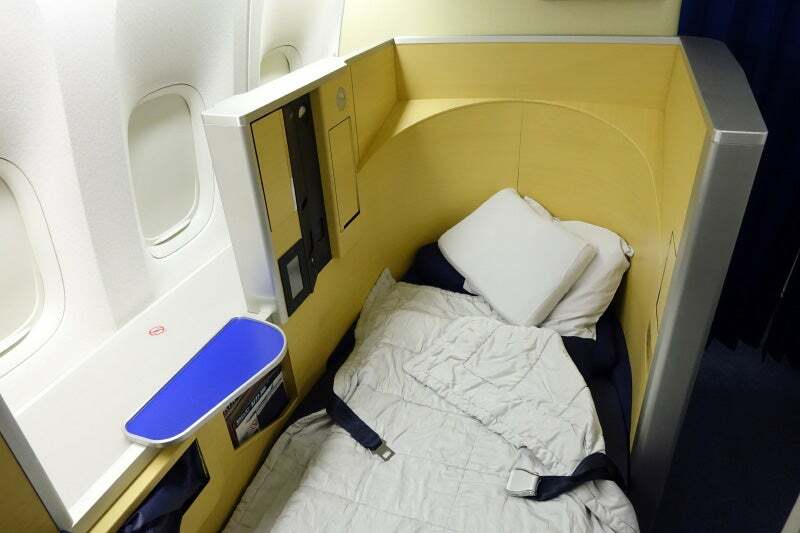 I had expected to be flying in United’s Global First cabin, which, while far roomier than the airline’s business-class seat, is hardly worth getting excited about. Instead, I ended up traveling on a far superior airline in one of the best first-class seats available. Sure, airlines like Singapore might have ANA beat overall, but for $850 including taxes and fees (half of my $1,700 Global First “sale” fare), this was one heck of a value. 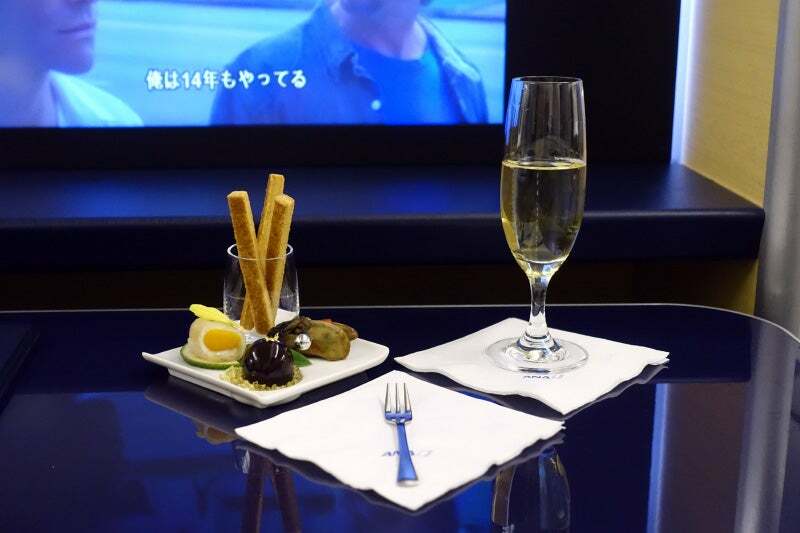 So how can you fly first class on ANA’s 777-300ER? ANA occasionally operates the plane on regional segments, but to get the “full experience,” you’ll need to book a long-haul flight. For flights from the US to Japan, United charges 110,000 miles one-way in first class, while Air Canada’s Aeroplan charges 105,000 miles (plus surcharges) and ANA’s own program charges 75,000 miles (plus surcharges). Since United doesn’t add surcharges to awards, that might be your best bet when redeeming for ANA. You can earn 40,000 bonus miles with the United MileagePlus Explorer Card when you spend $2,000 within the first three months, getting you nearly halfway to an ANA first-class award. And, since United is an Ultimate Rewards transfer partner, you can transfer points earned with the Chase Ink Plus Business Card or the Chase Sapphire Preferred card at a 1:1 ratio. 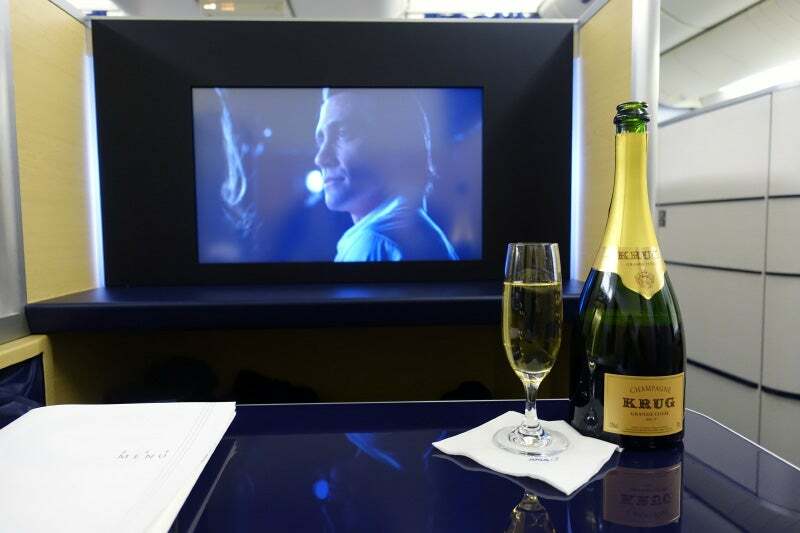 Krug Champagne in ANA first class. You can also redeem miles with other Star Alliance airlines for travel on ANA, and you can fly beyond Japan on any ANA award, though travel to additional regions will generally require more miles. You can also book using cash, of course, but expect to shell out $18,000 or more for a round-trip flight. Note that if the stars align on your travel day and your original flight ends up getting canceled, you can request that United (or another Star Alliance carrier) rebook you on ANA instead. For United to allow travel on a partner airline, even on a codeshare flight, all United alternatives must be unavailable; the agent will check, so save yourself some hassle by searching for United alternatives first. You can always request a partner airline even if United has availability on another flight, but chances are you’ll be required to fly UA.